Illness of the upper respiratory tract. Once both old and young birds have started their training and racing program they are likely to develop an ornithosis problem, showing symptoms of swollen or puffed feathers around the ears, dry plumage, blue flesh and a holt on the moult. 60% of young birds will develop ornithosis problems resulting in an increase of losses. 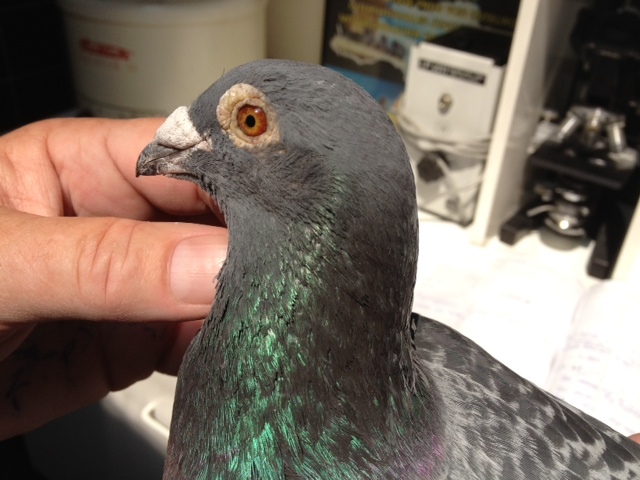 The pigeons will get home very tired after racing, when showing these symptoms pigeons must be directly treated with a combination of prescribed treatments and should be kept home in more severe cases for at least 1 week to avoid even bigger losses. BelgaTai, OrniSpecial, Ornisol, Orni 3 and OrniStop Tablets. 2 measuring spoons or 1 sachet (5 g) (2½ g per spoon) OrniSpecial+ 1 sachet (W.N. )in 2 litres of water or on 1 kg of feed for 40 pigeons, for 3 to 5 days. 1 sachet (5 g) or 2 measuring spoons (2½ g per spoon) OrniSpecial + 2 screw caps (5 ml) Ornisol in 2 litres of water, for 3 to 5 days. 1 sachet (5 g) or 2 measuring spoons (2½ g per spoon) OrniSpecial + 1 sachet (5 g) or 2 measuring spoons (2½ g per spoon) BelgaTai in 2 litres of water, for 3 to 5 days. 1 sachet(5 g) or 2 measuring spoons (2½ g per spoon) OrniSpecial BelgaTai + 2 screw caps (5 ml) Ornisol in 2 litres of water, for 3 to 5 days.